NOTE: Pax Christi USA is a member of the Faith Forum. This is the “Third Thursday for Israel-Palestine” action for May. Urge your representative to sign the McCollum letter asking President Obama to appoint a Special Envoy for Palestinian children. Defense for Children International – Palestine (DCIP) collected affidavits from 429 West Bank children detained between 2012 and 2015 that show three-quarters of them endured some form of physical violence following arrest. In 97 percent of the cases, children had no parent present during the interrogation or access to legal counsel. Israeli police also did not properly inform them of their rights in 84 percent of the cases. 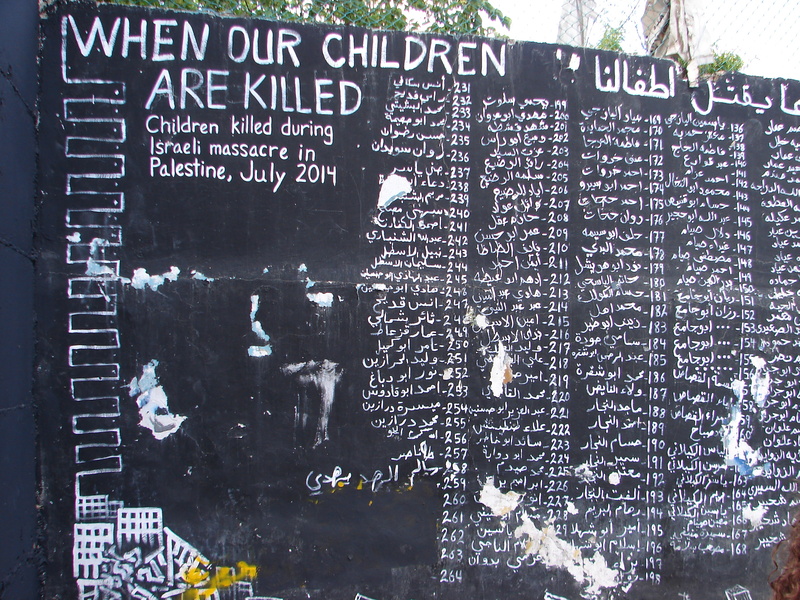 This mural in Aida Refugee Camp in the Occupied West Bank lists children killed in Israeli’s Gaza offensive in July 2014. DCIP statistics show that at the end of February, there were 440 Palestinian children in Israeli military detention. Seven of these children were being held under administrative detention, meaning they could be held without charges or trial indefinitely. We need to act on behalf of these most vulnerable members of society, and we have an opportunity to do just that. Minnesota Representative Betty McCollum has initiated a letter to President Obama, asking him to appoint a Special Envoy for Palestinian children. * Thanks to the Maryknoll Office for Global Concerns for taking action through their advocacy program.